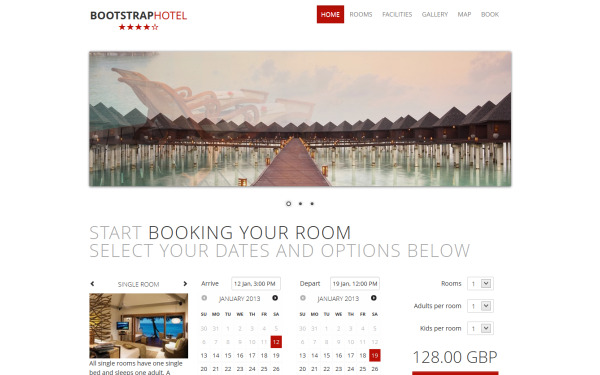 Bootstrap Minimal Hotel showcases the most important aspects of your hotel without overloading the user. The most attractive aspect of hotel websites is large images and minimal text and this theme exemplifies that. Most other hotel websites have an external booking engine added to the site that looks totally different. This theme provides 3 different versions of the booking form to make it available on almost all pages. This convenience allows a smoother booking experience for the user. Bootstrap Hotel is all about showing the user the best features of the hotel. It also contains some niceties such as the ability to view the room while booking. It's also compatible with any of the themes from http://bootswatch.com/ and we've included the LESS files - making it very easy to change. You can also easily add and remove components as it's based on the bootstrap framework.